In a large saute pan, over medium high heat, brown Italian Sausage for about 5 minutes, or until the sausage is no longer pink. Remove from heat and stir in broccoli. Whisk together eggs, milk, oil and baking powder. Season with salt and pepper. 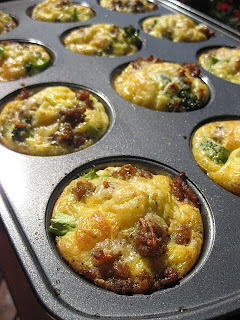 Lightly spray a 12-cupcake pan with oil.Spoon out the sausage and broccoli mixture evenly into each cupcake. Ladle the egg mixture over sausage and broccoli.